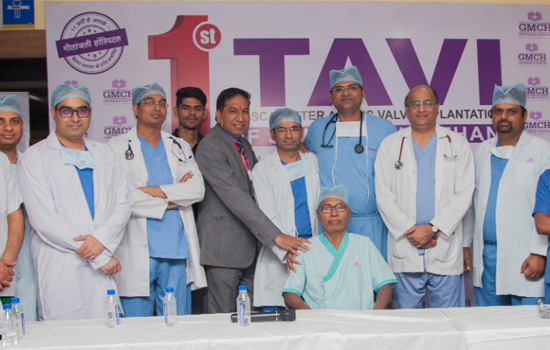 Udaipur: Wednesday 27th March, A 65-years-old-man is the first person in Southern Rajasthan to undergo Transcatheter Aortic Valve Implantation (TAVI) successfully claimed Geetanjali Medical College & Hospital’s Cardiac Team. The unique procedure does away with the requirement of open-heart bypass surgery. The landmark was accomplished by a team of doctors including Interventional Cardiologists Dr. Kapil Bhargava, Dr. Ramesh Patel, Dr. Danny Kumar, Dr. Shalabh Agarwal & Dr. Anmol, assisted by Cardiac Thoracic Vascular Surgeon Dr. Sanjay Gandhi & Dr. Ajay Verma, Cardiac Anesthetist Dr. Ankur Gandhi, Neuro Vascular Interventional Radiologist Dr. Sitaram Barath, CCU In-charge Dr. Nikhil Singhvi, Cath Lab Technician Lokesh Kumar and Nursing Staff Imran Khan. TAVI, he added, is a non-surgical procedure to implant heart valve (aortic valve mostly) by going from a groin vessel (femoral artery) a tissue valve is implanted by a catheter in a simple procedure similar to angioplasty. It is used on elderly patients who cannot have bypass surgery because of problems in other organs like lungs, liver and kidney. The kidneys of this patient were weak with narrowing of aortic valve. CEO Geetanjali Medical College & Hospital Mr. Prateem Tamboli congratulated the cardiac team for implanting heart valve without open heart surgery for the first time in Southern Rajasthan. “Now elderly people and other patients who cannot withstand open heart surgery can be benefited from this technique. Geetanjali Hospital has always established itself as a leader for world class innovations. Moreover, This technique is available with only few centers of Northern India, to which Geetanjali Hospital has added its name which is a proud moment for Geetanjali as well as the whole Udaipur City. The patient opted for this procedure are likely to recover early and can get back to their normal life soon. It also helps avoiding post surgery complications (if any). Such patients who are not appropriate for surgery are relatively at a higher risk if taken for surgery,” he added.